The optimum crop to plant for emergency forage should be determined by 1) when and how it will be utilized, 2) the forage quality needed, and 3) seed availability and cost. In 2003 and 2004, emergency forage trials were conducted at 5 locations across Wisconsin, Michigan and Minnesota. 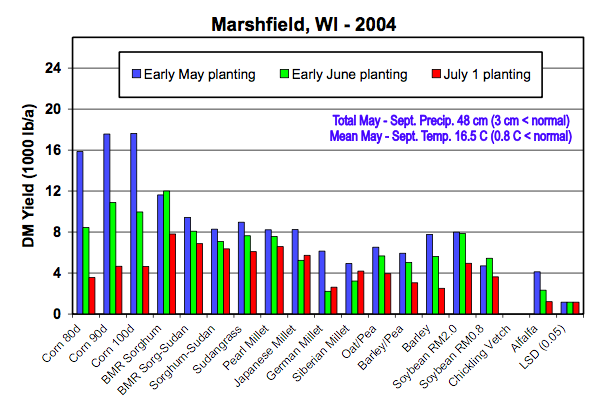 Trials were seeded at each of three planting dates: early May, early June, and ~July 1. Seeding rates were: 32,000 seeds/acre for corn, 10 lb/ac for forage sorghum, 25 lb/ac for sudangrass, sorghum-sudangrass, pearl millet, Japanese millet, and foxtail millets; 80 lb/ac for barley, 100 lb/ac for soybean, 125 lb/ac for small grain/pea, and 15 lb/ac for alfalfa. Soil potash and phosphorus levels were high at all locations. Barley and foxtail millets received 100 lb N/ac at planting. Corn and forage sorghum received 150 lb N/ac at planting. The multi-cut warm-season annual grasses (sudangrass, sorghum-sudangrass, Japanese millet, and pearl millet) received 50 lb N/ac at planting, and 50 lb/ac after each additional cutting (up to a maximum of 150 lb N/ac/yr). In general, harvest timing was scheduled to optimize yield and quality. Barley and foxtail millets were harvested at the boot stage, small/grain pea at milk stage, and soybean at R6-7. Corn was harvested at 1⁄2 milkline or 65% moisture, whichever came first. Forage sorghum was harvested at soft dough or 65% moisture. Alfalfa was harvested at 60 days after emergence, and 30 day intervals thereafter. Sudangrass, sorghum-sudangrass, pearl millet, and Japanese millet were harvested at a 6” cutting height whenever the crop reached a height of 36”. These harvest strategies resulted in one to three harvests per entry depending upon planting date. 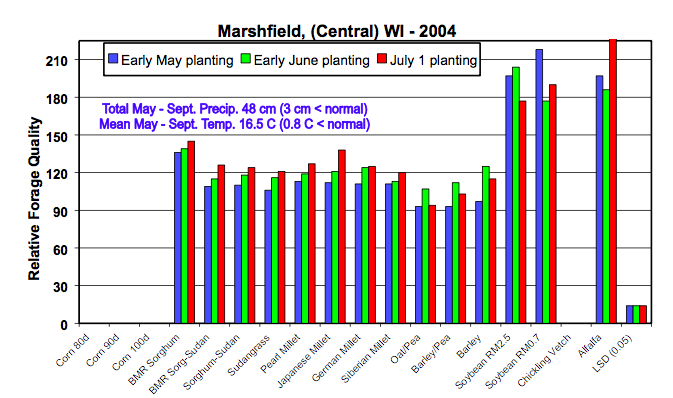 Relative yield and forage quality responses were similar across the two years so data is presented only for 2004 at Marshfield and Arlington, WI in the graphs. Corn for silage was usually among the highest yielding options for all planting dates and environments. One-cut BMR forage sorghum at times produced the highest DM yields (especially in southern Wisconsin, but was inconsistent and often failed to reach the target harvest maturity and moisture at other locations. Sorghum-sudangrass, sudangrass, and pearl millet produced good total season yields from 3 harvests for early May planting, and from 1 to 2 harvests for July 1 planting; their total season DM yields occasionally matched those for corn. Small grains with or without pea produced low yields when planted July 1. Foxtail millets harvested once at late boot to early heading produced consistently good stands and yields within ~60 days after planting. Soybean produced forage yields similar to foxtail millets, but required more days. Soybean produced the highest quality forage of all annual crops based on CP, NDF, and RFQ values. Among grasses, corn for silage had the least NDF, but also the least CP content. Despite high NDF content, foxtail millet forage had moderate RFQ and good CP content. Among grasses (corn excluded), BMR forage sorghum was among the highest in RFQ. Small grain-pea forage had higher NDF and lower RFQ values than expected; harvesting prior to milk stage may have improved quality. Multi-cut, warm-season annuals produced good quality forage of moderately high CP content and RFQ. 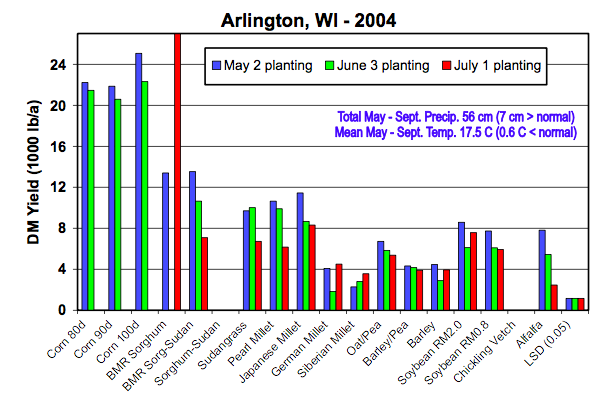 Barley had the greatest CP content, especially as planting date was delayed, possibly due to high N fertilization levels and relatively low DM yields. A small grain is the best option to replace the loss of first cutting alfalfa. The crop will be able to be harvested at the middle to end of June. Oats is likely the best choice, triticale a second choice and barley a third choice (due to lower yield). Planting small grain with peas (60 lb/a of 50/50 mix) will increase crude protein and palatability of the mix but not yield. Doubling the oats or triticale will increase yield about 15% but will be harder on the alfalfa. 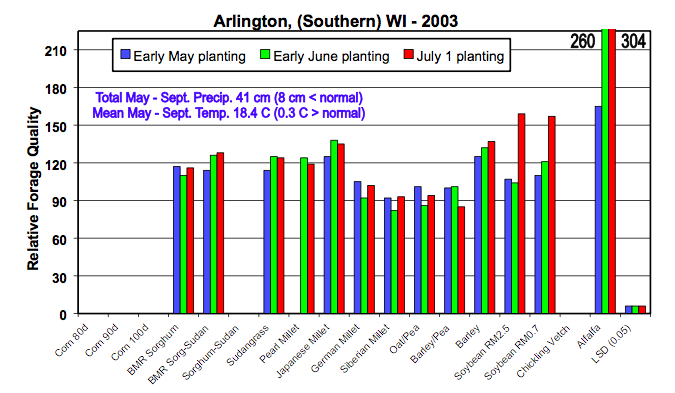 Spring planting winter wheat is not a good idea due to low yield. For silage, corn is the best high tonnage option. For haylage best choices are seeding Italian ryegrass at 2 to 4 lbs/a with alfalfa (12 lb/a) or solo seeding alfalfa (12 lb/a). For hay, best choices are seeding Italian ryegrass at 2 to 4 lbs/a with alfalfa or solo seeding alfalfa. Sorghum-sudangrass will produce the most tonnage for those want grass hay (2 to 3 cuttings at 36 to 40-inch height). Teff grass is a new possible alternative. However, Teff grass has not been widely tested in the Midwest. Summary by Dan Undersander from Research by Doug Holen, Paul Peterson, Dan Undersander, Marcia Endres, Rich Leep, Phil Holman, Mike Bertram, Vince Crary, and Craig Sheaffer; Universities of Minnesota, Wisconsin, and Michigan State.